Blond capuchin monkeys of the Brazilian forests use a special technique — smack, swirl, eat — as they fished termites out of trees, a new study of the critically endangered primates shows. 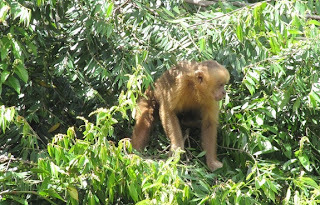 Blond Capuchins live in the forests of Brazil, but only about 180 are left in the wild. Antonio Souto's group discovered that they use a special technique-and-tool combo to fish termites from their nests in the trees. "In some observations we have seen them do this fantastic behavior, fishing for termites," said Antonio Souto of the Universidade Federal de Pernambuco in Brazil. 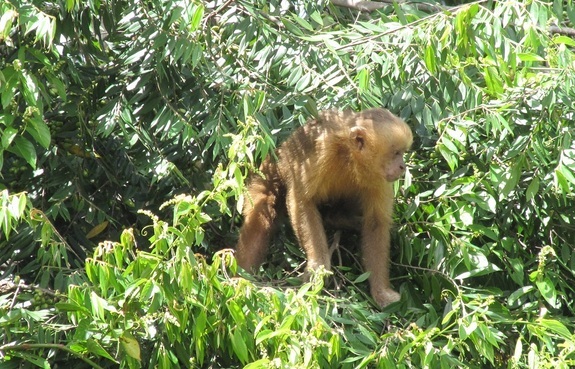 Similar insect-fishing behavior has been seen before, but the technique used by the blond capuchins is unique, he said. There are only 180 of the capuchins left in the wild. The research team monitored a group of six of them as it moved through the trees and noticed that three of the four adult males in the group would climb up to a termite nest and start hitting it with their hands. Each monkey grabbed a branch off the tree and poked it into the nest, using a rotational insertion technique to gain entry. They pulled out their sticks and inspected them, then ate the termites on them. Still holding the sticks, the monkeys tapped the nest again with their left hands and repeated the procedure. To see how effective this technique was, the researchers gave it a try themselves. They climbed up ladders to the termite nest and copied the monkeys' movements. "It really worked. The way they do it really enhanced their catch," Souto told LiveScience. "I think they can do better than we did; they have more experience." While the whacking and the use of the stick seemed to increase their take-home, the rotational movement didn't. Instead, the researchers discovered, that twisting prevented the stick from breaking, allowing the monkeys to reuse it. "In the beginning we saw how difficult it was to perforate the nest wall without rotating the sticks," said Souto. "This has an effect on the life span of the stick." The researchers are currently sifting through other data they collected while monitoring the monkeys, including on the animals' foraging behaviors. They plan to follow a separate, larger group of capuchins to determine if it fishes for termites the same way. Souto said, "It's possible that the technique is unique to this small group of animals." The study is published in today's (March 8) issue of the journal Biology Letters.